FREE LEGO Star Wars Building Event At Toys R Us! You are here: Home / FREEbies / FREE LEGO Star Wars Building Event At Toys R Us! Do you have Star Wars lovers in your life? 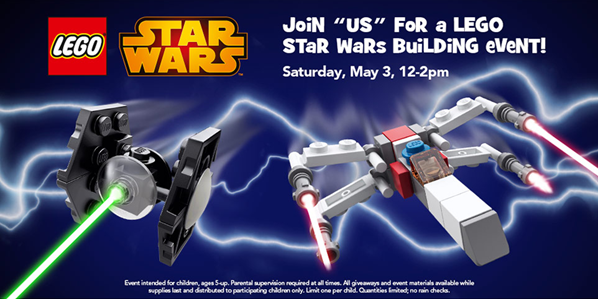 Tomorrow, Saturday, May 3rd, 2014 you can take them to Toys R Us for a FREE LEGO Star Wars Building event! LEGO Star Wars Micro TIE fighter AND LEGO Star Wars Micro X-Wing!